A cross-listed course is a course offered by two or more departments. The course's syllabus, schedule, etc. are the same (more or less), but it is offered under two or more abbreviations. Students enroll in the course under one or the other abbreviation; from their point of view, it is as if they have simply enrolled in one particular course. Cross-listing is managed by Academic Admins and Registrars and the details are visible to the course's faculty. WRI352 is an undergraduate creative non-fiction writing course. It is cross-listed with WRI522, a Master's-level writing seminar. Undergrad students enroll in WRI352; Master's students enroll in WRI522. The two courses share a schedule and several other features. Certain assignments are given to WRI352; others to WRI522. The two courses share most of the assignments and all other course content—lessons, discussions, etc. Cross-listed courses are managed on the Info view of an existing course. Add a course to an academic term according to the instructions provided in this article. Go to the new course's Info view. Click Course next to the course abbreviation. Choose a department and select the course with which you'd like to cross-list this one. Change the section number if need be. Repeat these steps as often as you need to in order to cross-list multiple courses. Remove a cross-listed course by clicking . Both courses have separate entries in the Academic Term > Courses report. A drop-down selector lets you flip from one course to another in the Assignments, Gradebook, and Roster views (see below). Depending on each course's individual settings, students can register for each course as normal. The roster lets you add students to any of the cross-listed courses. Refer to the section on Adding students in this article for complete details on adding students to the course. In the Add students or Import students dialog, select the course to which you wish to add the student(s). Make any other changes (enrollment status, enrollment date) as normal. If you enroll a student in the wrong course, click , delete the student, and then repeat the above steps to re-enroll him in the correct course. All courses share the same assignment groups and weights. Assignments can belong to all of the courses or be restricted to particular courses—when adding an assignment, just check the course(s) it will apply to. You must select at least one course for each assignment. To edit groups and assignments, first select a course from the drop-down. 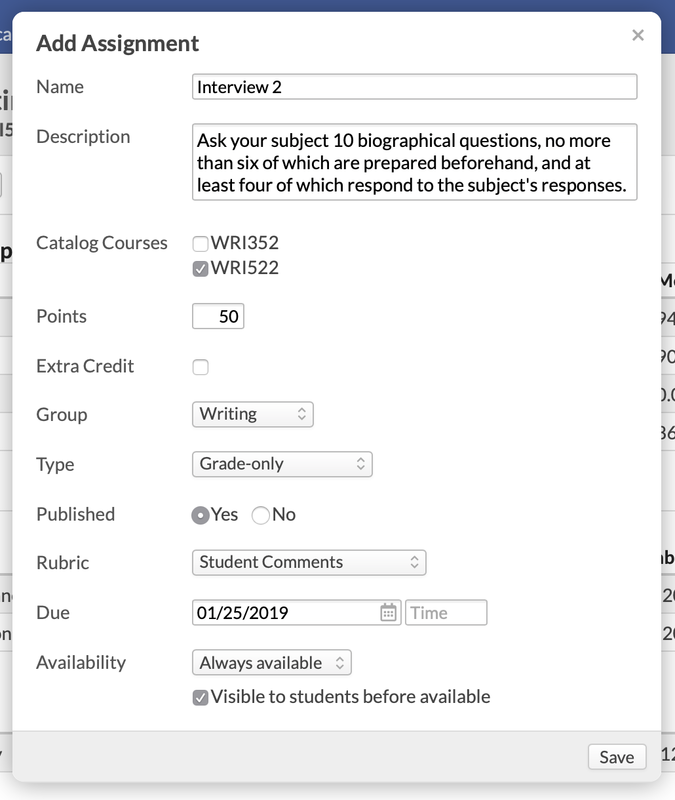 Individual assignment pages and course reporting features will only show the students enrolled in the course to which the assignment belongs. When you edit all grades, you'll see that some grading fields are blanked for certain students. This indicates that the assignment belongs to the course(s) in which these students are not enrolled. So, will this work for the Fall 2017 BT 3302 Systematic Theology that is running Jan 9, 2018 - Feb 6, 2018 and the course is also placed in the Spring 2018 as the same date?